A label and a neat binding are the perfect, most satisfying, finishing touches that you can add to a quilt. When binding a quilt in the same fabric as the last border cut the binding first before measuring and cutting the borders. 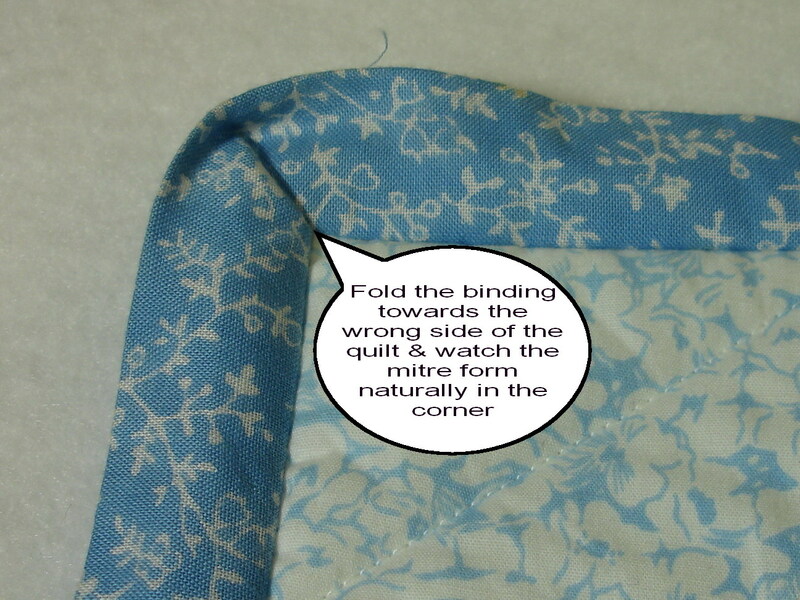 This way, if necessary you can adjust the width of the border to use most of your fabric. I often have to make the borders narrower because I never have as much fabric left as I think I will have. It is only necessary to cut the binding fabric on the bias grain if the quilt has scalloped edges, where the bias will help you ease the fabric around the curves. Cut striped & checked fabrics on the bias to make a binding with great visual impact. When making a continuous length of fabric for the binding, join strips with a mitred join to help the joins sit flat when the binding is stitched to the quilt. The only time I don’t join the binding strips with a mitred seam is if the fabric is striped or checked. Then I prefer to work with the print of the fabric. Use metal hair slides to hold the turned binding in place instead of pins. The hair slides are the metal type that spring closed and clamp the fabric in place. 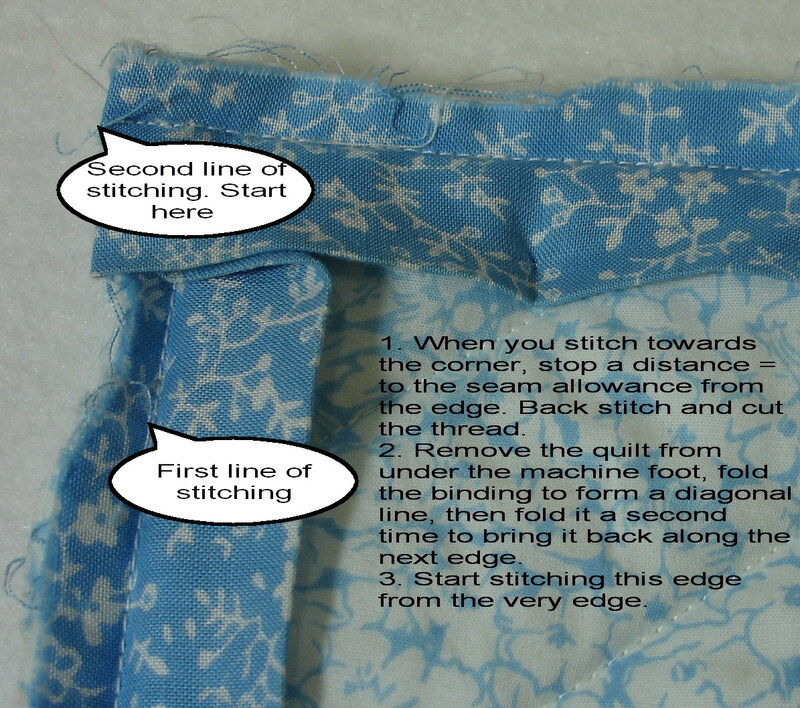 It is only necessary to use 3 or 4 and keeping moving them as a section of sewing is completed. No more pricked fingers. Hold the binding in place by first placing one pin about 3 inches away from the starting point and a second pin about 3 inches away from the first pin. 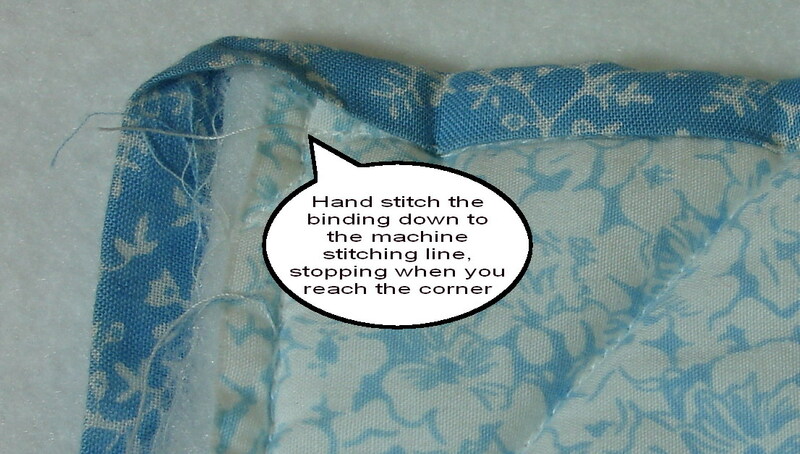 Stitch up to the first pin take it out and leap frog it across 3 inches further along the quilt edge. Stitch up to the next pin, take it out and move it along in the same manner. That way you don’t have to pin the binding down all the way around the quilt. I like to attach the binding to the front of the quilt with machine stitching and then fold it to the wrong side and hand stitch into place. Although I love machine piecing, and quilting, I find it very soothing, & satisfying, to put that last stitch into the quilt by hand. Keep the corners flat by folding the ” bulk” in the binding to opposite directions of the mitre on the front & back. I was going to write a more detailed instruction but found that Rita, at “Red Hot Pepper Quilts”, had already done a very good job of explaining the steps for making and applying a binding. 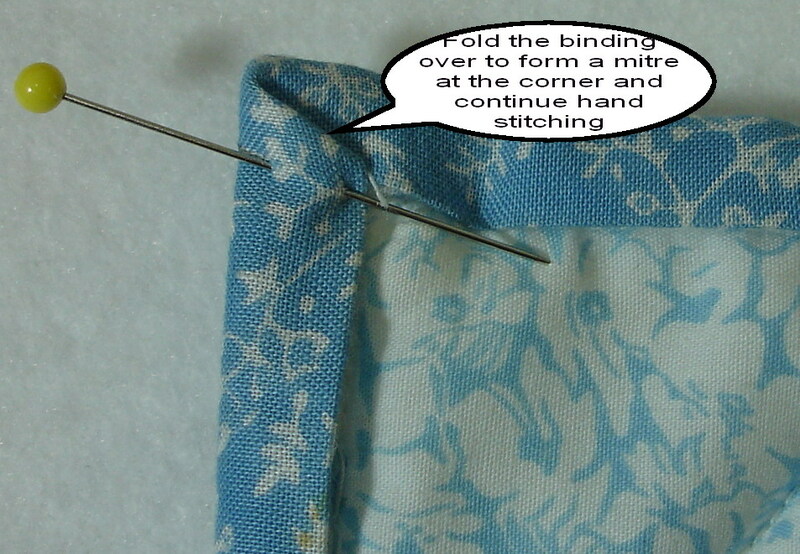 If you don’t want to hand finish the binding pop over to Pat Sloan’s Blog. She has a great picture tutorial showing you how to finish the binding by using the blanket stitch pattern on your sewing machine. Watch the video and then visit Pat’s blog for all the details. If you are looking for information about curved bindings, adding flanges or just looking for a different technique, check out the ideas I ‘ve listed on the link above.